400+ jazz drum loops featuring authentic jazz phrasing from a laid-back 100 bpm to blistering 325 bpm. This jazz loop collection is all about traditional jazz, focused on of essential timekeeping grooves for discriminating jazz musicians everywhere. It don’t mean a thing if it ain’t got that swing! For anyone writing Traditional Jazz, Bebop, or Swing, these are the jazz drum loops for you. 100% Pure Traditional Jazz Drum Loops! It don’t mean a thing if it ain’t got that swing! 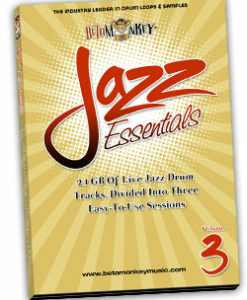 Jazz Essentials I offers an extensive collection of jazz drum loops for traditional acoustic jazz styles.. The royalty-free collection features more than 400 recorded phrases, with loops in authentic jazz drum styes from a cool and relaxed 100 bpm to a blistering bop at 325 bpm. This jazz drum sample collection is all about traditional feels and phrasings, a truly focused set of grooves for discriminating jazz purists everywhere. Quickly build authentic drum tracks that feel and sound like a live drummer playing a real song – that;s how this library was recorded. We’ve captured the human swing as well as the warmth of vintage drums and cymbals to deliver a veritable toolbox of jazz grooves. But, Jazz Essentials includes much more than the standard sample libraries. We’ve included a matching set of multi-velocity drum samples from the kit used in recording the loops. We’ve included a matching set of cymbal samples to allow greater flexibility in drum track construction. And, on top of this, we’ve included the source tracks. So, whether you want to construct your next jazz project with the loops and samples or you just want to match licks comping with the full source tracks, the rhythmic possibilities of Jazz Essentials are limitless. It will quickly become an indispensable songwriting tool for any jazz musician. Traditional Jazz Drumming: Authentic grooves using vintage drums and cymbals. The drum performances were performed for traditional acoustic jazz ensemble styles. 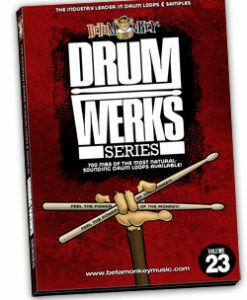 More than Jazz Drum Loops: In addition to hundreds of ready-made loops, the disc features stick counts, intro figures, endings and more. The complete source tracks are also included for greater use (try comping and trading off to sharpen your skills). Jazz Essentials is more than the “typical” loop CD found everywhere else. Wide Range of Tempos: 100, 120, 170, 250, 295, 325 bpm loop sets with variations at each tempo. Superior Rhythmic Realism: 4, 8, 16, and 32 bar segments that convey the authentic phrasing and sound that is uniquely jazz. Cohesive Drum Mix: All loops and samples are from a single recording session (all grooves, fills, etc. are sonically-matched). Fully-Sampled Drum and Cymbal Samples: The sample kit section includes multi-velocity samples of all the drums and cymbals recorded. Build grooves from scratch or use them to augment any of the 400 loops. 412 (582 MB) original, license-free 16/44 drum loops. 120 (117 MB) multi-velocity drum, cymbal samples. Available in 16/44 ACIDized WAV, APPLE LOOPS and REX2 formats. ALL ACIDized WAV, APPLE, and REX2 formats included with digital download or hard copy DVD. 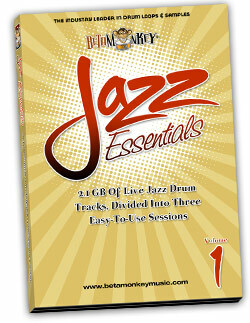 Jazz Essentials I Review: Read what Recording Magazine had to say about these jazz drum loops. Thanks for the awesome loops and terrific customer service!